For obvious reasons, there are hundreds of Jewish holocaust museums and exhibitions all over the world from the famous Simon Wiesenthal Center and Museum of Tolerance in Los Angeles to scores of Shoah exhibitions in Europe and Israel and the memorial centers in all continents. They are about honoring the victims and telling the story of atrocities and an immense suffering. There is however a museum that is not all about the suffering of the Jews but about a celebration of their life and history for a thousand years. 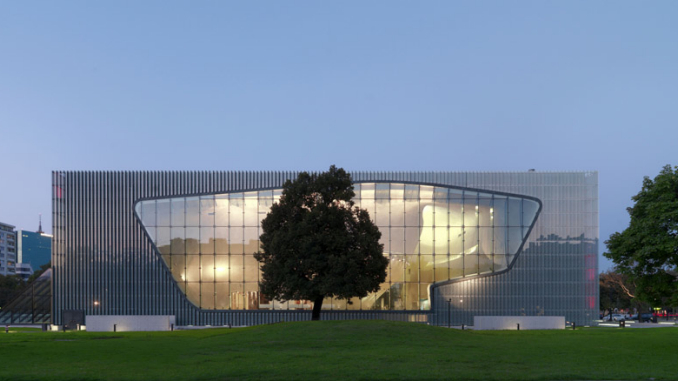 Museum POLIN (Museum of History of the Polish Jews) is one of the newest in Europe since it was established in 2005 and opened in 2013, and given the European Museum of the Year Award in 2016. The building itself is a very modern glass and stone structure by a Finnish architect company Lahdelma & Mahlamäki and it symbolically stands at the exact location of the pre-war Jewish quarter in Warsaw. The location is therefore not accidental but in general this is a museum that looks much more forward toward a dialogue about the place of Jewish culture in a complex Polish history then the recent traumatic past of the Holocaust. The core exhibition of the museum is the story how and when did the Jewish people arrive in Poland, a land that was to become the center of Jewish diaspora and the place that housed for centuries the largest Jewish community in the world. The main permanent exhibition is devoted to documenting the 1000 year history of Jewish life in Poland from some earliest documents till modern times. You start a journey of the Jewish migration in the 10th century when the first settlers moved in from Prague to Poland and then on to Kiev, all this being documented in reports of early Jewish travelers describing those lands and though Polish coins with Hebrew names attesting to settlements at that time. Medieval and Renaissance paintings and documents tell a story of a slow expansion to various cities and villages, and a developing trade and participation in Polish economic and political life. There is, for example, a prince’s decree from 1264 called Status Kaliski, which established legal rights of Jews living in central Poland, guaranteeing freedom of religion, protection from unjust accusations and the right to trade. Gradually a lot of Jews have assimilated by either becoming politicians or prominent office holders, acquiring polish names and titles or, in the case of 14th century beauty named Esther, a royal mistress of one of the most revered kings, Casimir the Great. In any case, since Jews were persecuted in other parts of Europe and this was the society that offered the greatest protection and opportunities, this was the land they chose to settle in greatest numbers. A special gallery called Paradisus Iudaeorum (1569–1648) houses an interactive display of cities of Krakow and Kazimierz that presents the riches of the thriving Jewish culture via virtual library of works by famous scholars of Jewish religious law, works of philosophy and social life. There are touch screens that activate a fragment of a medieval chronicle, provide a biography of a merchant or allow a closer look at an old document. Like other 21st century museums, POLIN displays historical information through a very tactile and interactive approach to every exhibit – you walk a cobblestoned street in pre-war Warsaw, you can hand-print a page of a 16th century book or you can sit in a compartment of an old train built by the 19th century industrialists. There are texts, movies and photos that document both the rise of Jewish settlements in Poland as well as a decline of this population through economic emigration (mainly to Europe, Palestine and both Americas) in the 19th century, and the 20th century political persecution and the WWII annihilation. The most surprising feature in the museum is a structure right inside the central part of the building. 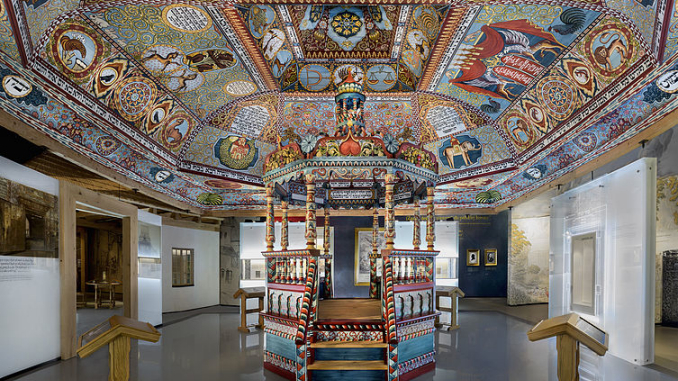 It is a reconstruction of an entire vaulted top (roof and ceiling) of 17th century wooden synagogue from a little town of Gwozdziec (then in Poland, presently in western Ukraine near Kolomyia). It has been painstakingly recreated in silver fir wood with traditional tools and meticulously painted with mineral paints of the era. You can enter it on the ground floor and gaze at the ornate walls decorations or you can view the actual construction from the floor above. Wooden synagogue structures have not survived in Eastern Europe. There are, for example, some preserved and partially restored stone synagogues in various parts of Poland but anything made of wood did make it in a form that would give justice to its original beauty. This amazing reconstruction is like a step into the past that you can actually make in by walking around the structure. 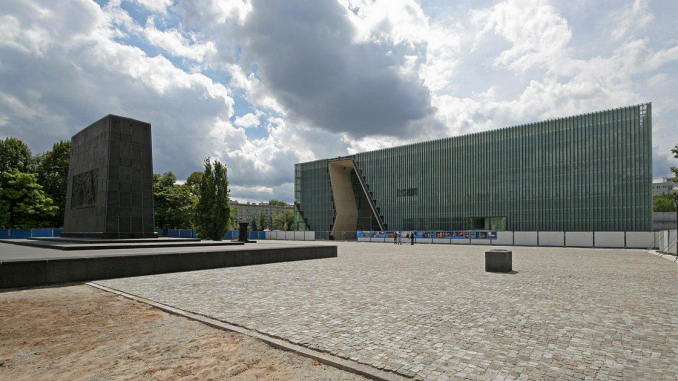 What makes POLIN museum exceptional that it celebrates and documents Jewish history and achievements rather than just focus on a tragedy of Holocaust. It brings insight into the long-gone customs, literary and cultural traditions, and it brings a way of living of an entire nation back into focus. It is also a place that allows anyone with Jewish roots to trace and understand a long history of their ancestors. Since a large part of the Jewish population in the world has indeed roots somewhere in the Eastern or Central Europe or Russia, this a great place for so many visitors to find out about an enormous journey through centuries that their families have once made.